A taste of the Baja region of Mexicali, Mexico. Mexicali Taco & Co. is about good food. What have are simple, well-made items that represent the northern-Baja region of Mexicali, Mexico. Our tortillas are soft & chewy using recipes local to northern Mexican cuisine. Our marinades, salsas and condiments are made fresh in small batches to give you the most flavorful additions to our delicious food. Everything in our salsa bar is there for a reason—for YOU to make YOUR taco custom to the flavors that YOU enjoy! You might be used to tacos that have double-layered tiny tortillas with a little bit of meat. We know that people are satisfied by meat and not masa, so you’ll only see nice-sized tortillas and a mound of meat with us. Our meats are of higher QUALITY and true asada—flame-grilled over the fire—not bistec, or on a flat-top. We are passionate about our food and want to deliver that in every taco, cachetada, vampiro & zuperman that we serve! It’s a combination of good food, good people and good times at Mexicali Taco & Co.
Mexicali is a border city in northern Baja, Mexico that is the hometown of Mexicali Taco & Co. founder Esdras Ochoa. Born in Mexico City and later growing up on the U.S. side in Calexico, the lively culture of Mexicali, especially its street food, made Esdras spend most of his weekends across the border with family. These culinary memories combined with the comfort foods of home created Mexicali Taco & Co. in 2009. Esdras opened up a street stand on 1st & Beaudry with mild success. Taco trucks and stands are a dime a dozen in L.A. However, the flavors were there from the beginning, and it was only a matter of time before Angelinos started to hear about the taquero whose purpose was to bring the Mexicali taco experience to the City of Angels. Paul Yoo was minding his business, checking out taco joints throughout L.A. to find a yummy taco. One random night, he and some friends stopped off at 1st & Beaudry, and the rest is history. He & Esdras became quick friends and great supporters of one another. 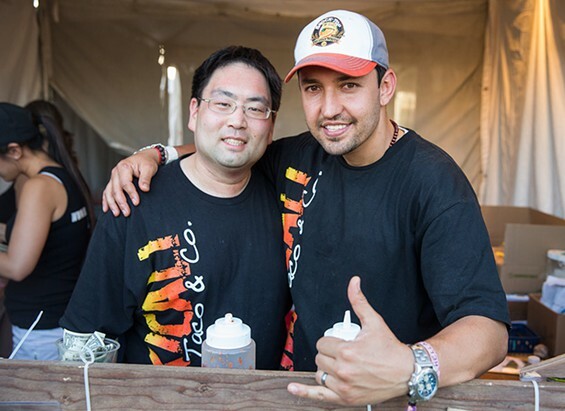 In the fall of 2011, Esdras & Paul decided to become partners and open up a brick and mortar for Mexicali Taco & Co., with the hopes of having an operation that could provide a better taqueria experience for its loyal patrons. So here we are at 702 N. Figueroa Street on Monday thru Saturday to fill your Mexicali taco cravings! Please come on by so we can serve you some of the tastiest tacos around! *Pictures on website courtesy of Mexicali Taco & Co. & Henry Lim Photography. Website designed by Eclectiv.